The town of Bournemouth, set on the cliffs of southern England amidst pine trees, was founded in 1810 and quickly became a popular seaside holiday town from early Victorian times. The importance of Bournemouth as a resort became evident when affluent gentry and invalids pursued the healthy pine scented air that Bournemouth enjoyed. Later, with the introduction of the railway, there came a surge of annual family holidaymakers from the northern industrial towns. Bournemouth is still popular but today the type of holiday and the accommodation have changed to keep up with the change in society. The author, who herself has run a Victorian hotel on the East Cliff, understands the hospitality business and also understands the history of how Bournemouth hotels that have evolved. There are many references including colour and black and white photographs of Bournemouth hotels over the last two centuries including one of the earliest, The Royal Bath Hotel, to today’s modern type of hotel, a Travelodge. 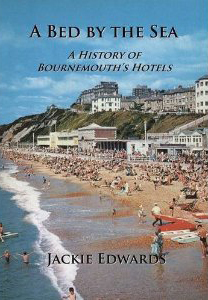 This is a fascinating study of the growth of Bournemouth’s Hotel and Hospitality business sector, from it’s small beginnings in the early 19th century, to the colossal tourist attraction it has become today.